This ring has the Masonic Sign- Square and Compasses, which shows that he believes in freemasonry. 'I know for a fact that when you get to 33rd degree Freemasonary the final secret is, Satan is God. The church of Satan helped design freemasonary in the same philosophy as this. Severaltimes in the Old Testament we read about a land flowing with milk andhoney. The land which God gave the Israelites after their departure from Egypt, the land of Canaan or the 'promised land,' was this landwhich was figuratively painted as flowing with milk and honey. maybe maybe not..i mean if kartel was in a lodge he would be veryyyy powerful as lodge members r filthy rich and from what i ave heard...kartel not even have him visa back....so who is to tell?? top secret indeed...he cud be behavin as if he were not so "up there"
> > I saw you yesterday as you began your daily chores. > > You awoke without kneeling to pray. As a matter of fact, you didn't even bless your meals, or pray before going to bed last night. You are so unthankful, I like that about you. > > I cannot tell you how glad I am that you have not changed your way of living, Fool, you are mine. Remember, you and I have been going steady for years, and I still don't love you yet. > > As a matter of fact, I hate you, because I hate God. > > He kicked me out of heaven, and I'm going to use you as long as possible to pay him back. > > That way, we'll be together twice. This will really hurt God. > > Thanks to you, I'm really showing Him who's boss in your life with all of the good times we've had. > > watching dirty movies, cursing people out, stealing, lying, being hypocritical, fornicating, overeating, telling dirty jokes, gossiping, being judgmental, back stabbing people, disrespecting adults, and those in leadership positions, no respect for the Church, bad attitudes. SURELY you don't want to give all this up. > > Come on, Fool, let's burn together forever. I've got some hot plans for us. This is just a letter of appreciation from me to you. I'd like to say 'THANKS' for letting me use you for most of your foolish life. > > older, and now, I need new blood. So go ahead and teach some children how to sin. would run somewhere, confess your sins, and live for God with what little bit of life that you have left. sinning, it's becoming a bit ridiculous. Don't get me wrong, I still hate you. yow yow and them fi know seh a Ants.man in the building and a kuff kaff kweff mi seh. 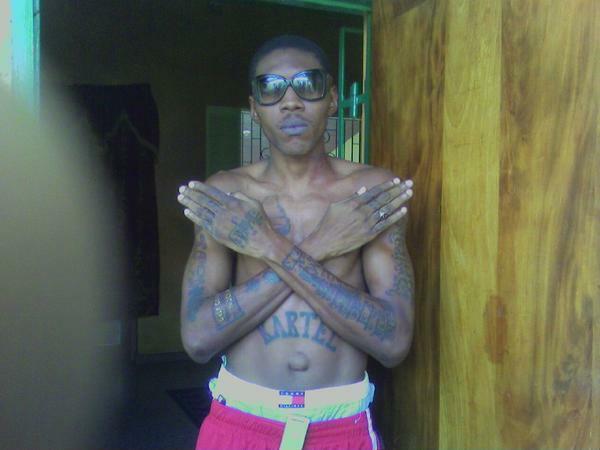 Firstly, Kartel is my favourite Dancehall artist but everyone has a way in which they portrays themself. If he wants to be evil thats just how he wants to be and if he wants to have alot of tatoos thats just how he wants to be. Although he should be aware that he is at a higher level of getting skin cancer. but u know you people are funny here is a man that is portraying evil and unnu stil a jump pon band wagon bout it so mite as well unnu worships the devil cus u are ranking one of his followers now how god would a think knowing you peeps doing tht ,then unnu seh unnu praise god unnu cnfuse ,an ants thnx fi the grand entrance, but peeps think bout it. thank you ava clear now peeps?